The desire to voice the artistic revelation of the truth of a precarious, multifaceted, yet integrated self lies behind much of Karol Szymanowski’s work. This self is projected through the voices of deities who speak languages of love. The unifying figure is Eros, who may be embodied as Dionysus, Christ, Narcissus, or Orpheus, and the gospel he proclaims tells of the resurrection and freedom of the desiring subject. In Król Roger Szymanowski uses the unifying Christ/Eros figure as a means of indicating that the King might be transformed from an anguished despot to a loving expressive subject; this is demonstrated in the encounters of King Roger with the voices of Narcissus, the Siren, and Dionysus. The composer fused Slavonic and Middle-Eastern mythological inspirations to fulfill a utopian vision of a pan-European culture bound together by the spirit of Eros. This according to Szymanowski, eroticism, and the voices of mythology by Stephen C. Downes (London: Royal Musical Association, 2003). Szymanowski would be 140 years old this month! 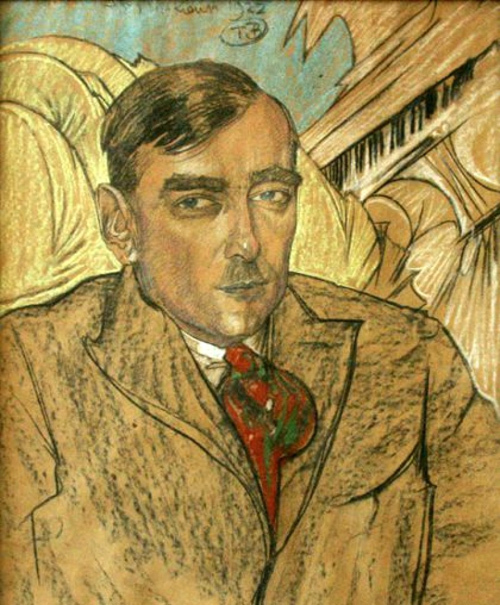 Above, a portrait of Szymanowski by Witkacy. Below, the ending of Roksana’s aria from Król Roger.